We’d love your help. Let us know what’s wrong with this preview of Marcos Martial Law by Raissa Robles. Published 2016 by Filipinos For A Better Philippines, Inc.
To ask other readers questions about Marcos Martial Law, please sign up. Matthew Lopez Yes, a comprehensive account gathered from primary sources. To be honest, the book is a difficult read. It is raw and uncensored, and you are thinking this cannot be real. But sadly, this is true narration of one of the darkest chapters in modern Philippine history and the excesses of the Martial Law regime. This is a mandatory read in schools, colleges and should be distributed in other countries. Raissa’s Robles’ work is hard to read, not because it is lengthy, but because it tells the story of the artrocities committed to our people. The discussion on how FM declared Martial Law, the accounts of torture survivors, and the fall of Martial Law were detailed. In addition, her detailed accounts of torture, especially to the medical student, whose brain was located in his abdomen, gave me shivers ---- I was reading the book during nighttime. As I was reading the book, I realized that the curr Raissa’s Robles’ work is hard to read, not because it is lengthy, but because it tells the story of the artrocities committed to our people. The discussion on how FM declared Martial Law, the accounts of torture survivors, and the fall of Martial Law were detailed. In addition, her detailed accounts of torture, especially to the medical student, whose brain was located in his abdomen, gave me shivers ---- I was reading the book during nighttime. As I was reading the book, I realized that the current situation we are having are the consequences of Marcos’ actions. And the collective amnesia, alas, that we experience today are mainly of the misinformation, forgetfulness, and forgiving nature of us. All hope is not lost, however. Good job, Raissa, for making this detailed discussion in Martial Law. I hope that your book will be read by children in schools so that they can learn more and not be misinformed about FM in this era of fake news and trolls. This book is one of the best books about Philippine history I have ever read. It is about the dictatorship of Ferdinand Marcos that began with his declaration of Martial Law on September 21, 1972 and ended in his ouster on February 25, 1986. It was a time of murder and corruption. During that dark age, good and innocent people were being killed, tortured, and imprisoned while Marcos was plundering the country. I was born on 2002. I did not experience Martial Law. I have heard about it and talke This book is one of the best books about Philippine history I have ever read. It is about the dictatorship of Ferdinand Marcos that began with his declaration of Martial Law on September 21, 1972 and ended in his ouster on February 25, 1986. It was a time of murder and corruption. During that dark age, good and innocent people were being killed, tortured, and imprisoned while Marcos was plundering the country. I was born on 2002. I did not experience Martial Law. I have heard about it and talked about it but I have never experienced it. But I did not need to. Even if I was born thirty years after Marcos declared Martial Law and sixteen years after he was peacefully overthrown by the People Power Revolution, I know that Marcos was a dictator, an oppressor, a plunderer, and a murderer. But this book taught me something. It taught me that the Marcos Era was more terrible than I imagined it to be. I already knew about the dictatorship's murder and torture but the book's descriptions showed me that the atrocities were far beyond my imagination. The book shocked me. Even if I already knew that Martial Law was horrible, the book taught me that it was a lot worse. Aside from surprising me, the book made me sad. It's not just that Marcos was selfish, corrupt, and power-hungry. It's not just that good and heroic people who opposed Marcos were treated in the worst possible way. It is also because we are forgetting all of these. After People Power, we Filipinos have done little to make the Marcos Era engraved in our country's memory. We have failed to learn from that dark chapter in the Philippines's history. 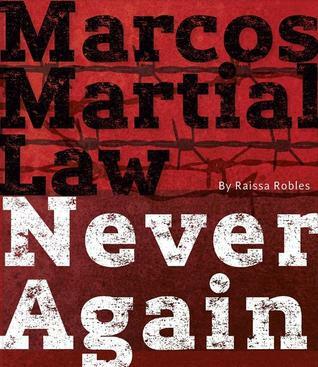 A must-read specially for those who didn't live through the Martial Law years. At times, it made me cry. Excellent work from Miss Robles.